HOUSTON  (March 15, 2011)  February marked a slight slowdown in the Houston real estate market following a galloping start to the new year in January when home sales rose for the first time in seven months. Despite last month's decline in sales volume, average and median home prices rose to the highest levels ever recorded for a February in Houston. February sales of single-family homes dipped 2.2 percent versus one year earlier. The popular middle segments of the Houston housing market, consisting of homes priced between $80,000 and $250,000, experienced declining sales while the low and high ends saw increasesthe most dramatic among the $500,000-plus luxury segment. For the second straight month, luxury home sales helped boost the average price of a single-family home, which climbed 6.6 percent from February 2010 to $214,039. The February single-family home median pricethe figure at which half of the homes sold for more and half sold for lessrose 3.9 percent year-over-year to $151,900. Foreclosure property sales reported in the Multiple Listing Service (MLS) declined 16.5 percent in February compared to one year earlier. Foreclosures comprised 21.5 percent of all property sales in February, down from the 24.7 percent share they claimed in January. The median price of February foreclosures fell 8.1 percent to $79,000 on a year-over-year basis. February sales of all property types in Houston totaled 3,906, down 0.4 percent compared to February 2010. Total dollar volume for properties sold during the month rose 4.7 percent to $790 million versus $755 million one year earlier. "The February housing report is encouraging if you recall that a year ago the federal government was rolling out the first-time home buyer tax credit, and consider the fact that home buyers today face more stringent lending guidelines than ever before," said Carlos P. Bujosa, HAR chairman and VP at Transwestern. "While we anticipate growth in the Houston real estate market this year, we do not expect it to come all at once," Bujosa said. "Factors that give us cause for at least cautious optimism in the months ahead are that local employment figures have been strong and that we are about to enter the spring home buying season." The month of February brought Houston's overall housing market largely positive results when all listing categories are compared to February of 2010. Total property sales declined fractionally while total dollar volume, average price and median price all rose on a year-over-year basis. Month-end pending sales for February totaled 3,034, down 4.2 percent from last year. That suggests the probability of lower demand when the March figures are tallied. The number of available properties, or active listings, at the end of February rose 6.8 percent from February 2010 to 49,839. The growth in available housing pushed the February inventory of single-family homes to 7.3 months compared to 6.3 months one year earlier. That means that it would take 7.3 months to sell all the single-family homes on the market based on sales activity over the past year. The figure still compares favorably to the national inventory of single-family homes of 7.6 months reported by the National Association of REALTORS? (NAR) and is unchanged from Houston's January months inventory. February sales of single-family homes in Houston totaled 3,257, down 2.2 percent from February 2010. This follows January's 7.8 percent (corrected) increase in single-family home salesthe first increase in seven months. Broken out by segment, February sales of homes priced below $80,000 climbed 19.7 percent; sales of homes in the $80,000-$150,000 range dropped 16.0 percent; sales of homes between $150,000 and $250,000 declined 3.4 percent; sales of homes ranging from $250,000-$500,000 rose 10.7 percent; and sales of homes that make up the luxury marketpriced from $500,000 and upsurged 28.4 percent. Both the average and median prices of single-family homes achieved the highest levels ever for a February in Houston. The average price of single-family homes in February was $214,039, up 6.6 percent compared to one year earlier. At $151,900, the median sales price for single-family homes rose 3.9 percent versus February 2010. The national single-family median price reported by NAR is $159,400, illustrating the continued higher value and lower cost of living available to consumers in Houston. HAR also breaks out the sales performance of existing single-family homes throughout the Houston market. In February 2011, existing home sales totaled 2,734, a 2.0 percent increase from February 2010. The average sales price rose 5.3 percent to $197,838 compared to last year and the median sales price of $139,700 increased 3.5 percent. The number of townhouses and condominiums that sold in February slid 5.3 percent compared to one year earlier. In the greater Houston area, 306 units were sold last month versus 323 properties in February 2010. 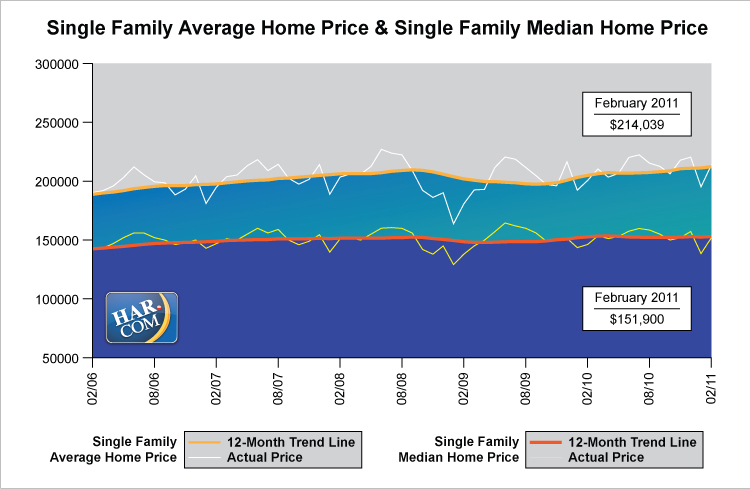 The average price was flat at $158,795 from February 2010 to February 2011. The median price of a townhouse/condominium declined 7.8 percent to $118,000. Demand for single-family home rentals soared 20.0 percent in February compared to one year earlier. Year-over-year townhouse/condominium rentals increased 15.9 percent. 7.3 months inventory of single-family homes compares favorably to the national average of 7.6 months.